With e107 you have more options how to check if your emails are sent. And some plugins could use their own way how to send email. e107 itself has test buttons for checking if emails are sent. Problem starts when you got no errors and your email never come. So what to do? First help: DEBUG. If you got this help answer with email related question, it means that you should use inbuilt mail logging functionality. If you use Developer mode too, it's bonus to it. So: how to initiate mail logging? 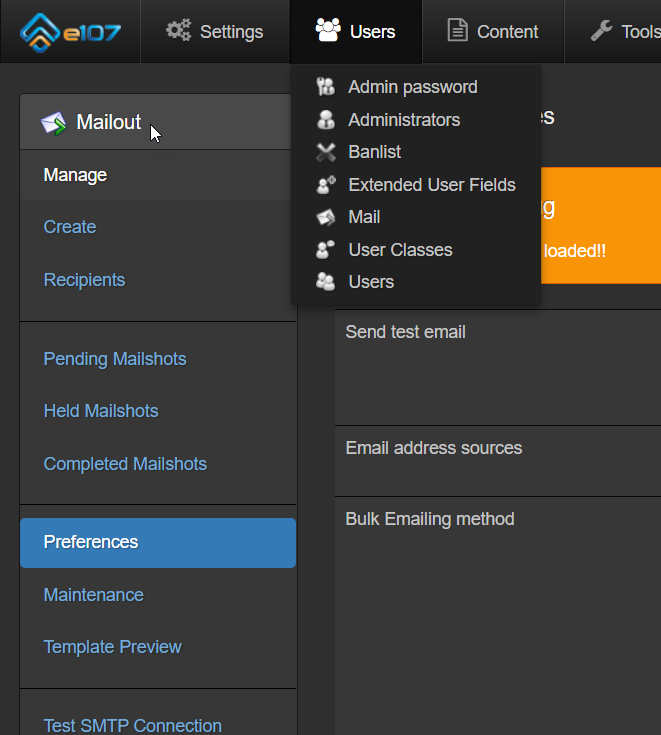 Go to User tab and select option Mail / Preferences. You can select if you want to send email or just make snapshot of it. If you get this message (green), it means that e107 works correctly, you have problem with you mail server. and find your email there. In my case: Error info: Could not instantiate mail function. If you have debug on (as browser addon in my case), you get full debug info in admin area. So only solution is set SMTP connection (on both places). From address is set in Email address for emails under Site preferences. It looks like this helped. So now I am able to send emails from localhost too. Next area you should always check is sending notify emails. In Notify Tools you can do it very easy. Sometimes (mainly on localhost) I got white page after clicking on Test email, but it needs only to refresh page. After plugin installation - check Notify tools - if plugin is listed there, it uses new Event manager for mail sending. If plugin is not there, it uses classic way and you have only one option - set logging on, simulate action and then check mailoutlog.txt file.